With all of the inflatable spas on the market right now, finding the right one can be difficult. There are so many different statistics, features, and reviews that it can be all but impossible to decide which is right for you. Thankfully, there is one question that can help narrow down your choices more than you might think: How many people does your tub need to fit? If you can answer that question, then you can find the ideal hot tub with a lot less worry than before. So, do you need a spa just for you and that special someone? Or for a family? Maybe you’re looking for something to fit the whole gang? Either way, you can start here. 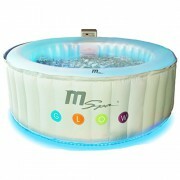 For those looking for a more intimate experience with their inflatable spa, the Lay-Z-Spa Siena is the one for you! Though compact enough to seat only one to two people, the Siena certainly doesn’t skimp on the perks. 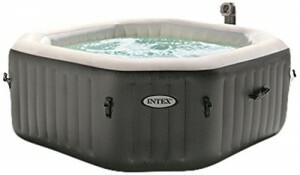 This spa packs in luxuries found in larger inflatable hot tubs, but win a more compact package! An Airjet Massage System circles the inside, lining it with 127 AirJets. This will give the user all the bubbles they could ever hope for. The Rapid Dual Heating System will quickly heat up your water to a balmy 40 degrees Celsius, perfect for unwinding after a long day. For those looking for simplicity, there are no tools required to set up this tub, and it can be done in just a few minutes. Looking for all of your spa equipment in one package? The Siena comes with a beverage table, chemical floater, two charcoal filters, and a setup DVD. 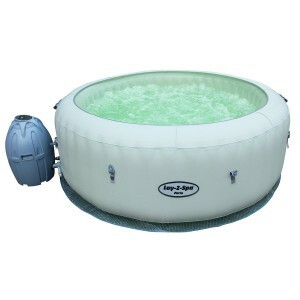 If you prefer that your inflatable tub have the look of a more traditional permanent hot tub, then you should consider buying the Intex Octagonal Bubble Spa. This spa is top-of-the-line, and certainly worth the price. It comes equipped with a system that includes 120 bubble jets for the ultimate comfort. The heating system is adjustable, and can quickly heat water between 20 and 40 degrees Celsius. Best of all, these systems can be adjusted using the convenient control panel. Do you find that soaking for long periods of time is tough on your skin? Or do you have a skin condition that makes it sensitive? Then you’ll be interested in a rather unique feature of the Intex: It comes equipped with a Hard Water Treatment System. This will make the water easier, not just on your skin, but on your swimsuit and the tub, too. The Intex Octagonal Bubble Spa is a good choice for those who enjoy having a few friends over for an intimate dip in the hot tub. But it works just as well for a single occupant, or for a couple. This makes it one of the most versatile spas on the market. If you are looking for an inflatable spa on a budget, then this is for you. The Lay-Z-Spa Miami is the perfect combination of luxurious and affordable. Though it is on the more frugal end of the spectrum at just £399 on average, it still packs all of the little extras that so many look for in a hot tub. Because it seats up to four comfortably, this is a great choice for people who enjoy inviting others to share a soak, or for a family looking for a way to bond at the end of the day. And your time in the hot tub will certainly be relaxing: The Miami comes equipped with Lay-Z-Massage Jet System, perfect for giving you the counter pressure and bubbles you need to really soothe you. Want a bit of heat? The water can be heated up to 40 degrees Celsius for your comfort. If you’re a beginning hot tub owner, then you’ll be especially interested in the equipment that comes with the tub. To take the guesswork out of setting up and maintaining your purchase, it comes with a chemical floater, two charcoal filter cartridges, a heater pump, a cover, and a setup/maintenance DVD. Are you looking for something a bit more “fun” in an inflatable spa? Then you’ll need to look no further than the MSPA Glow. This spa, as its name suggests, is well known for its most prominent feature: The LED light strip embedded inside of it. These lights, when turned on, encompass the water (and anyone in it) in a soothing, gentle light that adds a bit of playfulness to your relaxation. But the Glow isn’t just a good choice because of its light strip. 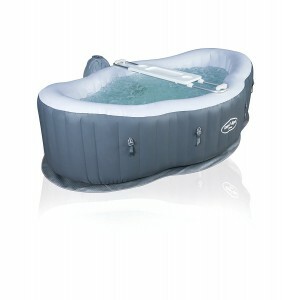 This tub, which can seat up to four people comfortably, also has all of the luxuries normally found in permanent spas. 118 powerful jets line the inside, giving you the bubbles that you crave. Want it a bit warmer? Then you’ll enjoy the ceramic heating system, which can boost the water up to a lovely 42 degrees Celsius. It’s also a breeze to set up. Following the instructions, you can have the Glow set up in approximately ten minutes. The pump that is included comes with a Whisper Quiet Design, meaning that you can set it up for a spontaneous dip at three in the morning and not wake the neighbors! For those who worry about safety, there is another perk: It comes with a spa cover that has a digital lock. If you’re looking for a reasonably priced inflatable spa that is big enough to hold a group, then you should definitely consider the Lay-Z-Spa Vegas. This spa is large enough to comfortably seat up to six people at a time, perfect for parties or other get togethers. The Vegas was so popular that it was voted UK’s Bestselling Hot Tub of 2013! This spa has all of the amenities that you could want in an inflatable spa. It has a Lay-Z-Massage Jet System, to give you the best, most relaxing massage possible. The water can be heated to a stress-melting 40 degrees Celsius, which perfectly compliments the jet system. This is the perfect choice for those who are looking for a mix of luxurious and affordable. Are you looking for an inflatable tub that feels more like the real thing? Do you want something sturdier, with more cushion, so you don’t feel like you’re sitting on the ground? Then you should consider purchasing the Lay-Z-Spa Palm Springs. This hot tub, which seats up to six, is perfect for a large family or for those who enjoy having friends over. One of the defining features of the Palm Springs spa is its TriTechTM build, which offers three layers of support. 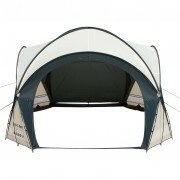 This boosts its durability, as well as its comfort, making it a good choice to leave up long-term. It also has a cushioned floor, so that you don’t have the feeling of sitting on the hard ground. Like other Lay-Z-Spas, this comes equipped with a Lay-Z-Massage system, a quick-heat system that can reach up to 40 degrees Celsius, and everything needed for set up. Uniquely, the Palm Springs allows for you to pre-program your tub to begin heating up at certain times, which is convenient and eco-friendly. Looking for a “party tub”, one that is exciting and can be used by more than a few people? Then the Lay-Z-Spa Paris is the right choice for you! This spa can comfortably seat up to six adults, making it the perfect choice for entertaining. Or, if you have a large family, it can accommodate everyone, so there’s no complaining about waiting for their turn. This spa comes with the features that most other Lay-Z-Spas do. There is an AirJet Massage System, which as 87 AirJets to give you all the bubbles you could need. The water in this spa can be heated to 40 degrees Celsius in a relatively quick time period. The most unique and fun thing about the Paris, however, is its light show. The Paris comes with LED lights that, with an included remote, can be changed to seven different colors. Choose the colors based on your mood, or set them on a loop! 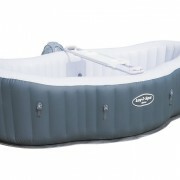 Are you a new to inflatable spas, and aren’t quite sure what you need to set up or maintain them? Are you looking for something all-inclusive, that can fit your friends or family? If so, a good starter spa would be the MSPA Luxury Alpine. 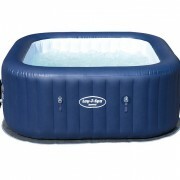 The Alpine comes with the same luxurious features common to most inflatable hot tubs. It has an air jet system that will provide you with all of the cushioning, delightful bubbles that you want. It can also heat your water up to a blissful 42 degrees Celsius, the perfect temperature to melt your stress away. The heat can be adjusted using the unique built-in control box. But there are other perks to buying this besides the features. It comes with everything that you will need to set it up, so there’s no last-minute panic because you forgot to purchase something. Everything necessary to use your tub is included! This is the spa for those who intend to have large groups over for a collective dip! 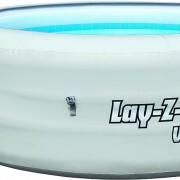 The Lay-Z-Spa Monaco is one of the largest inflatable hot tubs on the market, holding as many as eight adults comfortably. The Monaco, produced by the UK’s Bestselling Inflatable Hot Tub Brand, is a great choice for large families, or for a tub that sees a lot of parties. 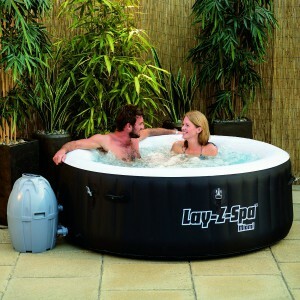 The Lay-Z-Spa Monaco has all of the luxuries that the Lay-Z-Spa brand offers. There is a Lay-Z-Massage Jet System, which packs in 80 jets for the best massage possible. The water can be heated up to 40 degrees Celsius, an ideal soaking temperature for many. The temperature and jets can be digitally controlled, so that you can change it very quickly and without much fuss.